Yes, I’ll bet you thought I was done with winter scenes. Well I couldn’t leave well enough alone, after receiving a couple of requests for more . . . besides there are so many winterscapes waiting to be done, why not? So here is the first of several oil pastel (7×5) winter scenes that I’ll be painting, and boy was this one a real doozy to get involved in. First I used an artist canvas board as the surface, and while there is nothing wrong with that particular kind of surface – there’s a gesso on top that does not respond well to my slick Senneliers (like painting with wet lipstick). So this particular scene underwent two major re-works by scraping as much as the oil pastel off as I could. What would have been a beautiful bare Willow in the winter, there was no way I could get the wonderful long twigs painted – they became much too chopped do to the texture of the surface and slickness of the oil pastel. So after the scrape down I had a thought last night – decided to paint a large bare oak instead, and slowly what I envisioned began to emerge. I love a challenge and this one was just that . . . here’s Silent Walk. Was began was inspired by a reference image from Elena of pmp. 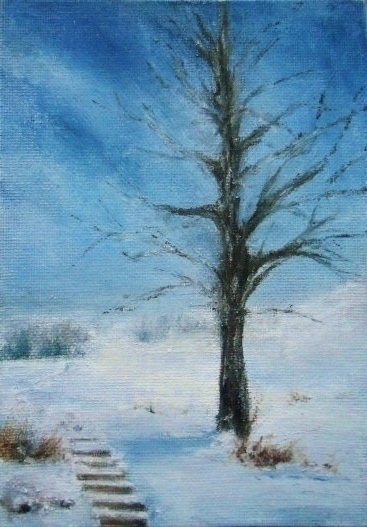 This entry was posted in About Oil Pastels, OPs New Paintings and tagged Oil Pastel, snow, steps, tree, winter. Bookmark the permalink. Trees are really a fine motive in wintertime. Great atmosphere! Thank you Joerg, so sorry it’s taken me some time to get back. Really appreciate hearing from you. I particularly like this. It is fresh and illusive. Thanks Cyndi. This is in the Black Forest (Germany), I changed the scene somewhat as the painting just took me to its own destination. Thank you Calee – love your description of falling into the painting, lovely compliment to this artist! So funny Poppy, great comment – yep I’ll bet we’d have a good laugh. Thank you for your comment, great to read first thing this morning. The lonely steps and the one lone frozen tree you have captured so well make this lovely painting and your title perfect! Thanks Pink Saucer – I really appreciate your feedback means a lot. I’m enjoying these winter scenes so much. The colors and shading are so beautifully done. Hi Timethief, thank you so much – means a lot. There are still a few colors that I want to use for snow, so there will be a few more pieces to come. Mary they are all great and joy to watch even if you had enough. No doubt you master the season and we enjoy to see your great work doing it again and again. Thank you Doron, I’m so glad you are enjoying this painting. Yesterday I thought the painting was a lost cause, last night I gave it slim hope, and today once I started working out the Oak everything fell into place. Thanks for the encouragement. I must say this painting is lovely even if winter is not my favorite time of year. Then I will have to admit snow makes everything look pretty and cleaner. Thanks Susan, great to hear from you. I don’t miss the coldness that comes with snow, but I’m with you fresh snow makes for some beautiful scenery. Thanks Elena. Glad you found it interesting, sometimes I get an urge to try oils or watercolors – maybe one day. But for now I’ll keep playing with the OPs. I can not wait for my lesson in water color Mid Feb. I love your pieces Mary. Thanks and I can’t hear that you are really enjoying watercolors! Before you know it Mid-February will be here – looking forward to seeing your paintings. I love your winter scenes. We’ve a long ways to go. Take advantage of it :-). Thanks Sharon, you are right – what two months worth of the white stuff! I just might have a few more coming. Don’t you feel warmer now? I do. Keep these wondrous winter scenes coming! Thanks Craig, we’ll see what I can paint tomorrow – stay tuned!